Often, while I was learning to cope with my first baby, I would experience a ‘sense’ of what I should be doing to help her settle. It would niggle at me but I often ignored it. Sometimes I would ask the Cliche if he thought I should follow my ‘sense’ but like me for him this was all new too. So we would head to the place most new western parents go, ‘the book’. There are books for every step of a child’s development. There are even books for that time before a child is conceived – when you are negatively pregnant. Now there is the movie to go with them. Not one of those practical birthing and parenting movies develop ed by your community health service. No, a heavily invested-in Hollywood movie with superstars and directors and everything. While pregnant I could easily while away a few hours deciding on the baby books to buy. Now, with two toddlers under two and a half there is no time to read said books. For me, it truly is a case of learning on the run, finding that moment in between tantrums and masticating on stones and other bits of the garden, to do a bit of ‘a Google’ to find out how I can stop both of these activities. As parents, we are often so time poor that even trying to keep up with the changes in the Wiggles can be difficult – and we know how rarely they’ve been replaced. Time, or having none, is not the only reason I don’t read baby books very often anymore. Truth is I don’t really want to. The ‘book-denying epiphany’ came one day when I was struggling with M1 – the first clichette – as a one month old who just wouldn’t settle. “Why don’t you try feeding her again?” my watching mother-in-law suggested. “Try it and see what happens. What’s the harm?” this wise woman replied. She was right. There was no harm. In fact, there was a whole lot of no harm. There was peace and rest and calm from that point onwards (or at least until toddlerhood and the before-mentioned tantrums. If truth be told, they’re not so much tantrums but full-on firestorms of toddler maelstrom). Suddenly there was no urgency or desire to go out and get another book. So why do we question our instinct when it comes to parenting? Surely there’s some natural elements when we are learning to care for a baby, so why do we often repress them because we have a book? Is it because of the years we spend studying textbooks at school, rote learning vapid passages of Shakespeare and Ruth Park to pass our high school education? Is it because we dare not question something that has received the honour of being published? Is it because book marketers are really, really, really good at their job (1. undermining our confidence, and 2. thereby selling more books)? Or is it because parenting a new baby is exhausting, so our natural instinct is hiding, grabbing a quick forty winks behind the rocks in our head? I am not denying the need for guidance to help us through the parenting process. I own several parenting books. The real questions are ‘how many do I need and how do I work out which is the best one for me?’. What if someone in my mother’s group has a much better one? What if they have the books that get their baby to sleep through the night at six weeks, or walk first, or cure teething pains? How puzzling that we are more likely to ask for advice on which book to buy than to ask for advice on actual parenting. Oh the pressure … And as new parents, this is what we deal with. 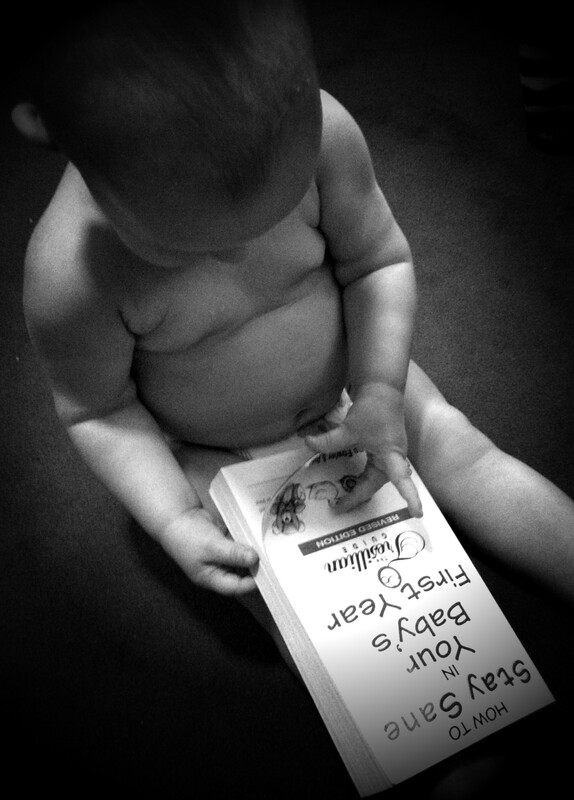 We’re sold an ideal of a perfect baby and the books that can help us achieve one. The most helpful book I read before having M1 gave me permission to have no idea what I was doing as a new parent. It also had the best instructions for getting a baby to latch on. Interestingly enough, it did mention a parenting instinct. Ironic, isn’t it? What we need is a try before you buy process, where you get to find the book that is right for you, fits in with your karma and general vibe – I guess that would be called ‘using a library’. I do believe there is a little thing inside our heads that lets us know when we’re doing the right thing because sometimes it simply feels right. And sometimes there is our mother-in-law. Let’s not forget they’ve been there too and if it wasn’t for them, we wouldn’t be where we are – struggling with their son’s child! Posted in Uncategorized and tagged books, instinct, mother-in-law, parenting. Bookmark the permalink.